“Sister of Mine” marks the third release for multiple Music Newfoundland and Labrador winner Sherry Ryan. 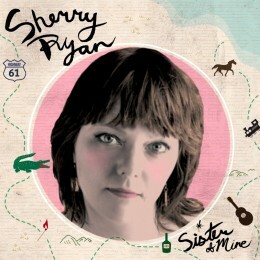 Known for her autobiographical and earnest songwriting Sherry continues her strength for the craft on “Sister of Mine”. Sherry is skilled at penning love songs proving that a mix of love gained, love kept and love lost makes for a heartfelt exploration of the human heart and condition. On this record Sherry enlists the help of producer/musician Phil Sedore (Amelia Curran’s War Brides and Juno winning album Hunter, Hunter). He plays the majority of the instruments on the album and it has his signature folk, country flavour. The album has a lilting, meandering gait that paints a portrait of a warm, thoughtful night at the far end of summer. Sister of Mine is a lovely and poignant follow-up to her aptly titled second release, “Wonderful Cures”.